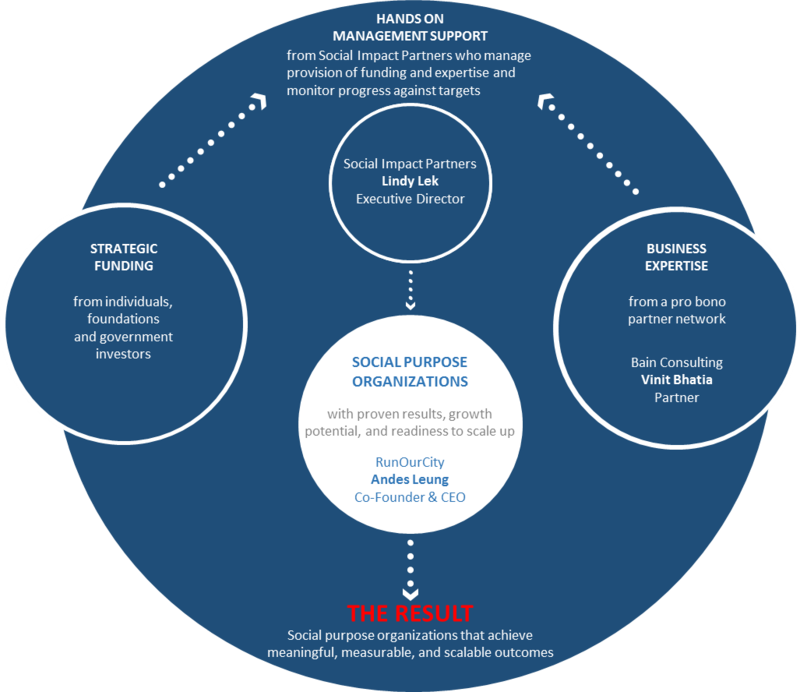 Social Impact Partners (“SIP”) and its partners will fund HKD 2.5 million over the course of four years (2015-2019) and provide a combination of hands-on management support and in-kind business expertise to RunOurCity Foundation (“ROC”) http://runourcity.org/. The funding will consist of a grant and an interest-free loan. SIP’s capacity building work focuses on the business model, social impact goals, fundraising, organizational capacity and external/internal communications. “Success requires dream-making ideas, right strategy in right time, plus strong execution power. SIP is not only providing funds support, but also connecting various commercial expertise to support social enterprise,” said Andes Leung, Co-Founder & CEO, RunOurCity. As a result of working with SIP, ROC is well positioned for final approval of an additional HKD 2.5 million in matching funds from the HKSAR Social Innovation and Entrepreneurship Development Fund (SIE Fund). ROC is a Hong Kong-based registered charity that aims to positively impact the lives of young people through running. The Youth.ROC program works with teenagers, aged 13 or above, to improve their coordination, physical strength and stamina for a stronger body and boost their self-confidence, concentration and perseverance during the challenging transition from childhood to adulthood. ROC aims to increase the number of participants in its program tenfold by 2019. Its business plan focuses on building organizational capacity in order to achieve this growth and ensure ROC’s long term sustainability. “It’s been a stimulating experience working with SIP. Through the interaction with Lindy in the due diligence process, we have pushed ourselves internally to strategise and prioritise with a much higher degree of clarity,” said, Cheung Leong, Founder & Chairman, RunOurCity. In addition to coordinating the work of each partner / contractor, SIP continues to support the development and execution of annual business planning priorities and a comprehensive strategy to support staff and leadership to navigate this demanding phase of their growth. SIP’s model for scaling social impact is by its very nature collaborative. SIP brings together organizations and individuals from the private, public and not-for-profit sectors to collectively create greater social impact. SIP adds value to the social purpose organizations (SPOs) in our portfolio as well as for our network partners who are contributing their valuable expertise – mostly, on a pro bono basis. Our investment in ROC provides an example of how our collaborative model helps enhance the capacity, efficiency, measurement capabilities, sustainability and impact of the organizations in our portfolio, while also increasing the returns for those who invest money or time in their development. SIP investors know their money funds social programs proven to be effective and is leveraged by active management support. The repayment of the principal amount of the loan allows investors to recycle their philanthropic capital into other SIP projects, for added impact. SIP’s partners who contribute their services also benefit from this collaborative model because SIP engages them at the right time and on the right projects. As a result, their contributions are more strategically aligned with business goals and corporate social responsibility mandates.